This article first appeared in the December 2016 issue of Sound & Communications Magazine. 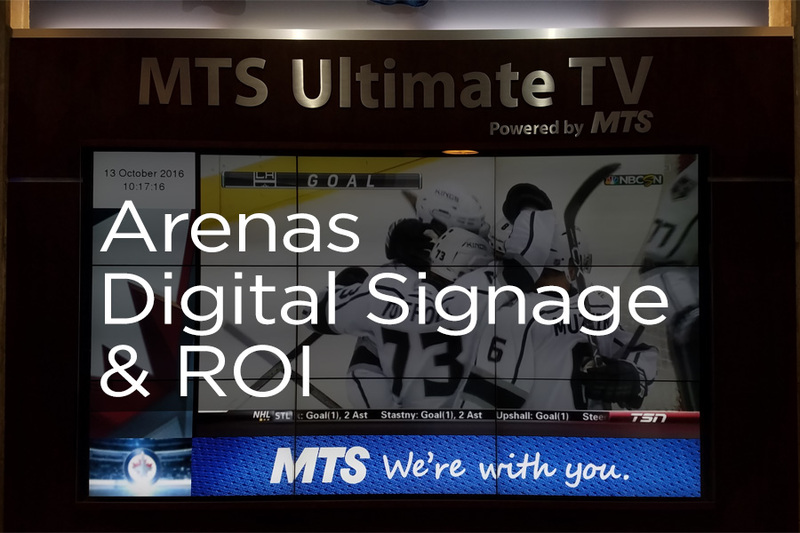 It was written by Terry Germany, Senior Innovation Engineer for Alpha Video and CastNET, discusses how stadiums and arenas are effectively using digital signage to increase ROI. In sports venues today, athletic action is just the first layer of entertainment produced by teams and stakeholders invested in providing an experience that gets fans off the sofa and into stadiums and arenas. Next-level fan engagement is now delivered by bigger video screens, better audio, and tighter integration of audiovisual content across all platforms. Delivering a unified branding experience packaged around informative and engaging content is essential to pleasing fans, teams and sponsors. An important component to designing a stadium-wide experience is digital signage, which has evolved to serve a multitude of purposes in sports venues. In addition to the easily recognized areas of concessions, concourse and luxury suites, digital signage now encompasses branding across a multitude of team support, media and fan engagement areas. A dynamically designed digital signage not only thrills fans with interactive and informative content, but also helps sports venue operators answer sponsors’ needs. For their sponsorship dollars, brands are seeking opportunities for new and novel moments of exclusivity, along with unique social media moments offering sharable images throughout a facility. Support for these many purposes requires creation of engaging digital signage content for use on screens large and small. This means designing visually enticing layouts for everything from concession menus and wayfinding to stats and even traffic reports for stadium exit strategies. Today’s media-savvy fans are discerning customers, and expectations are high when it comes to visual imagery. To achieve the goals of engaging fans, retaining sponsors, and making life easier for facilities managers, digital signage content design should be looked at from all three perspectives. Each party can benefit from a variety of new layout and systems integration solutions. A significant part of the fan experience is must-see game-day content that is shown on the scoreboards, video walls and digital signs. This content includes high-impact motion graphics, game replays, integrated stats and data, news feeds, social media, live video from other events and fan videos. This information-rich live game stream can also be repackaged for use across digital signage displays throughout a facility, delivered via IPTV and then enhanced with customized “L-wraps” that deliver branding messages, social media, player statistics or informational content relevant to a display’s location. In stadium restaurants, for example, an L-wrap can incorporate logos into a background with a look and feel complementing the establishment’s branding. For displays in concourse areas, L-wraps can include updates related to traffic, weather, social media and news highlights. Feeds for these can be programmed to run automatically, so the administrator does not have to manually update the data. Displays that are dedicated to other purposes beyond game-day action can also boost fan engagement. As more and more displays are implemented throughout venues, screen real estate is expanding, which means that statistics and other fan-friendly information can be displayed in a number of new ways. In addition to integration with real-time stats providers for the traditional “screen crawl,” there is demand for dedicated digital signage displays that dive deep into numbers. These provide the specifics for fantasy sports, regional competitions, or any combination of play-by-plays that fans might want to enjoy during the game. Whether their sponsorship investment is something big like stadium naming-rights or something small like the brand of hot dog at the concession stands, sponsors are looking for a good return on investment (ROI), and digital signage delivers. Advertising via digital signage continues to be one of the most essential factors in boosting ROI, and today there are numerous ways to enhance a brand message. At an essential level, digital signage displays can be used to scroll ads throughout the venue, with different sponsors and layouts designed specifically for the purpose, whether it’s a single display in a luxury suite or a full-scoreboard and ribbon displays takeover. To make sure the right content goes the right display at the right time, integrators can program systems for easy deployment by in-house content development teams. One of the most valuable brand enhancers enabled by digital signage are “moments of exclusivity,” which provide a stadium-wide takeover of all video displays for a logo display or themed graphic tied to action in the game. To produce the most immediate and effective impact, digital signage programming should allow for the trigger of moments of exclusivity at the push of a button. When a touchdown is scored by the home team, one button changes every screen and monitor throughout the venue to boost crowd engagement with a highly visual celebration. Other actions can also be programmed into moments of exclusivity, such as music cues or confetti drops. When it comes to in-game spending, particularly for those ever-important revenue-boosting concession sales, menu boards continue to evolve. Now it’s possible to integrate displays with several point-of-sales systems for instantaneous price and product updates. From an operations standpoint, stadium digital signage systems are evolving with new analytics tools. Systems designers can work with venue management to integrate solutions that deliver reports on ad display frequency, and new digital signage technologies also provide analytics on crowd demographics. Beyond game day, stadium use for various corporate and community events can also be enhanced by digital signage. For these purposes, integrators can develop a web-based dashboard management setup for the Event Day Operator (EDO) that simplifies digital signage deployment for multiple events happening simultaneously (i.e., a corporate event in the south club, a wedding in the north club, and a car show in the stadium area). The EDO dashboard provides centralized visibility, control and monitoring of set-top boxes controlling displays throughout the venue. For every player in the digital signage game, there are a multitude of ways to boost ROI in sports venues. The combination of growing number of displays and an increased emphasis on fan experience is a great win for everyone who wants to root for the home team.